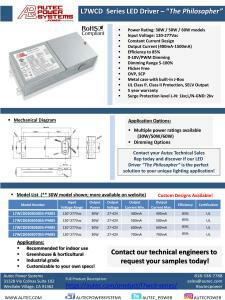 Autec will be rolling out new product briefs, starting with “The Philosopher” L7WCD series constant current LED Driver. Westlake Village, CA (October 8th, 2018) – Autec Power Systems just finished compiling their first set of new graphic tear sheets – set to provide the most informative marketing tools for their partners and customers. Autec will be rolling out product briefs frequently, starting with “The Philosopher” L7WCD series. This constant current LED driver is popularly known as “the inspector's best friend”! It comes with a built in J-Box configuration, dimming capabilities, wide output range, and multiple power ratings – making it perfect for indoor LED lighting retrofit applications! More details along with full technical data sheets can be found on their website as linked below.